Let’s face it, bug bites are annoying and sometimes painful! The thought of camping and having a nice BBQ seems so great and then that pesky mosquito comes along to ruin the fun. One of my favourite sayings that I tell my three kids is… “If you think you are too small to make a difference, try sleeping in the same room as a mosquito!” So what is the solution… we want to teach our kids to be outside and to play especially in the summer months and we don’t want to be slapping a whole munch of chemicals all over our kids, so I can say personally that I love the Family Buzz Patch. It is all natural, you do not need to spray anything, it’s not harmful to your cloths or skin and it last 8 hours! It is safe for anyone and it is a pleasant citronella scent. BUG REPELLING PATCH: ALL NATURAL! NO SPRAY! NO RUB! LARUS PHARMA FAMILY BUZZ PATCHES are well suited for infants and children and they are the only product available that can be used for newborns as protection while outdoors. These unique patches are patented and are supported by Canadian, European and American Testing. 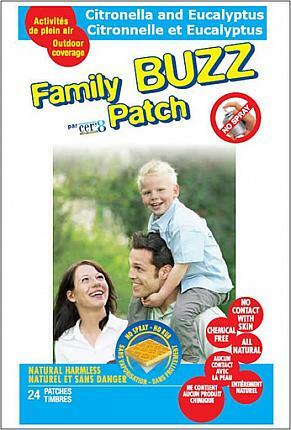 Family Buzz Patches have been scientifically tested at North Carolina University. Think of a glow stick, simply take the little square and crack it so that the patented citronella formula is activated. It is recommended to use two patches (one behind your neck and one behind your knee) to give you normal coverage outdoors. You can also stick Family Buzz Patches on strollers on either side for great protection to the passenger within. Each box comes with two individually wrapped sleeves of 12 patches.